First baseman Christian Williams excels at both phases of the game. Known primarily for his defensive play; Williams has made a living on being a reliable fielder within the organization. Recording a .990 fielding percentage in 491 innings last season in Vancouver was an impressive stat for Blue Jays fans to see as they’re always looking for solid defenders to climb the ranks. As expected with his great numbers, Williams takes tremendous pride in his ability to be reliable in the field. Progressing nicely at the plate as well, Williams improved his slash line to .236/.341/.340 last season in Vancouver compared to .220/.285/.318 in Bluefield in 2015. 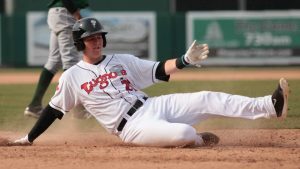 The increased production has carried over to the beginning of his season in Lansing where Williams has notched seven hits in 20 Midwest League at-bats. A major component to his improving numbers in the batter’s box is his continual focus on improving his plate approach. Another area that has helped Williams find continued success in pro ball has been his ability to adjust to the increased conditioning required at the next level. All of this will be put to the test in Lansing, as Williams is competing in his first full season. But with the positive attitude Christian Williams brings to the ballpark every night, he shouldn’t experience any issues in 2017.